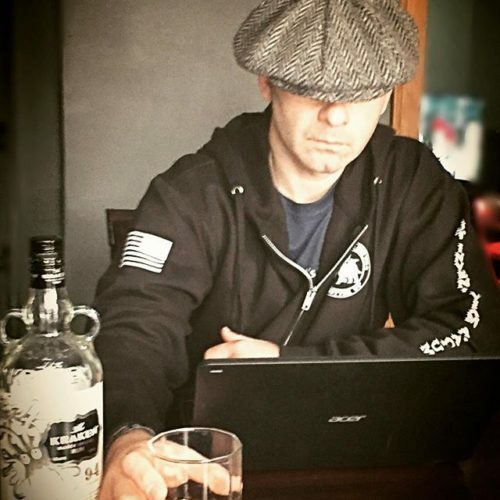 Posted on February 3, 2018 by Bryan wrote in Blog. When the Cobra buckle first came on the market, everyone wanted a piece. I remember when the trend was so hot, you could have a belt made out of twine, but with a nice buckle it went for over $100. Well, almost. 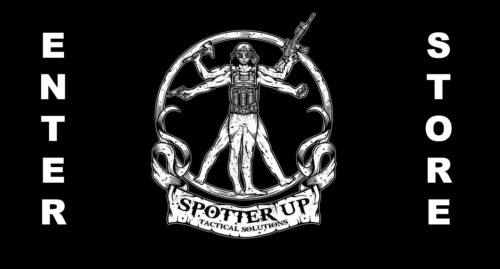 As all tactical-cool fads go, the trendy and the functional grow to separate, and the end-user dictates which ones stick around. It didn’t take long before the idea made its way into the K9 market. Klik belts started was started in 2004 by a group of guys who wanted one focus and one mission. 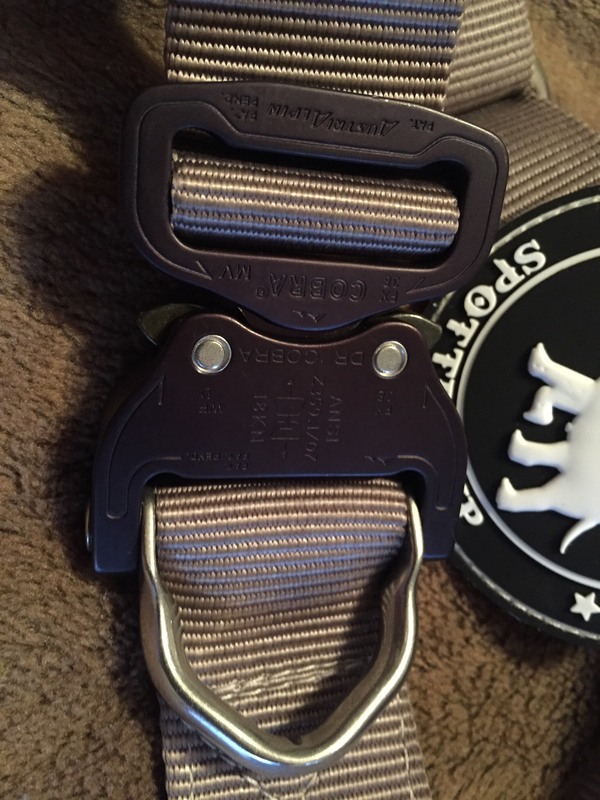 A better belt, through a better buckle. By all accounts, they have proven themselves. The Cobra buckle they use is Austrian-made, 7075 aluminum alloy with solid brass release clips. 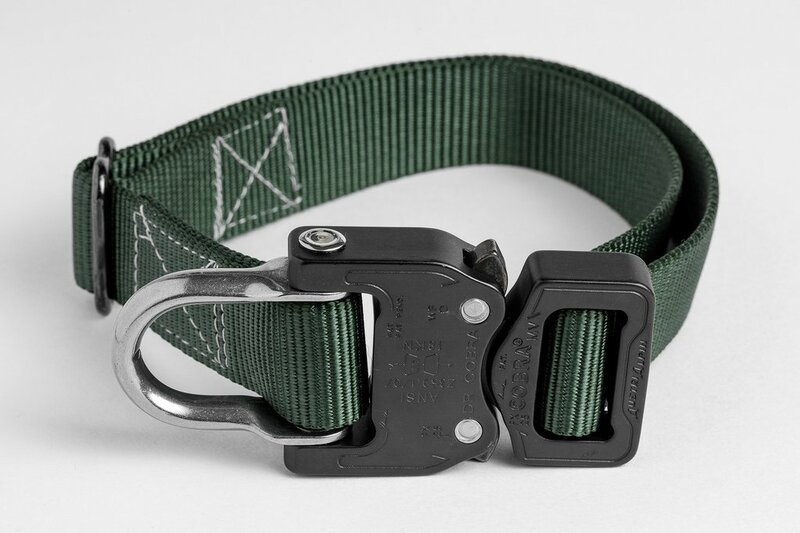 The rest of the mil-spec webbing is built around that, whether for a belt or dog collar. We received an extra large K9 collar to play around with. Previously, I was inclined to stay away from the Cobra fanfare for my canine. One reason, was that I didn’t want to give in to fads. I was used to a large plastic secured buckle on some collars, additional security of Velcro on others, or a traditional leather and hole type setup. The later was usually my go to because it’s secure, reliable and perhaps more importantly, comfortable for the dog. The other consideration, was that when some collars and vests were made with these types of buckles, there was little consideration given to how it feels on the dog. Some of them tend to dig into the fur or skin, some roll when pressure is applied. While most working dogs have enough drive to get past the minor discomfort and will still perform, I simply didn’t want the extra stress or hot spots. The Klik collar works with the dog. The buckle is enclosed in a loop of double box-stitched mil-spec webbing, and regardless of how the leash is manipulated, the flat part of the collar and the buckle itself, lay on the body of the 4-legged companion, and don’t turn to dig into him. The other cool part is that the D-ring is part of the buckle and built into one of the clasps. 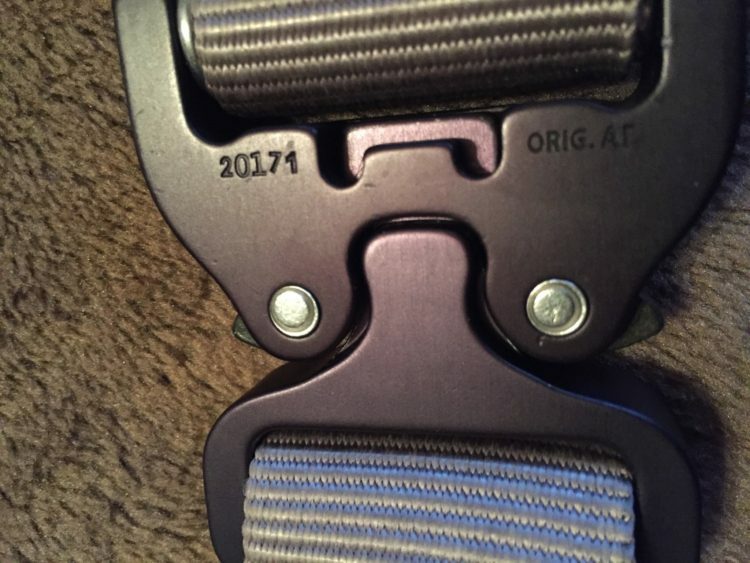 My initial thought, was that the D-ring, adding some weight and leverage to the buckle, might overcorrect. I was pleasantly surprised that the collar works really smooth as an extension of the lead, whether attached to a carabiner on the handler, or in hand. There is no extra pressure or leverage, and the corrections, if directed by the handler, are still very mild but effective. My other first impression, is that I wanted the nylon webbing to be either double-lined or reinforced. 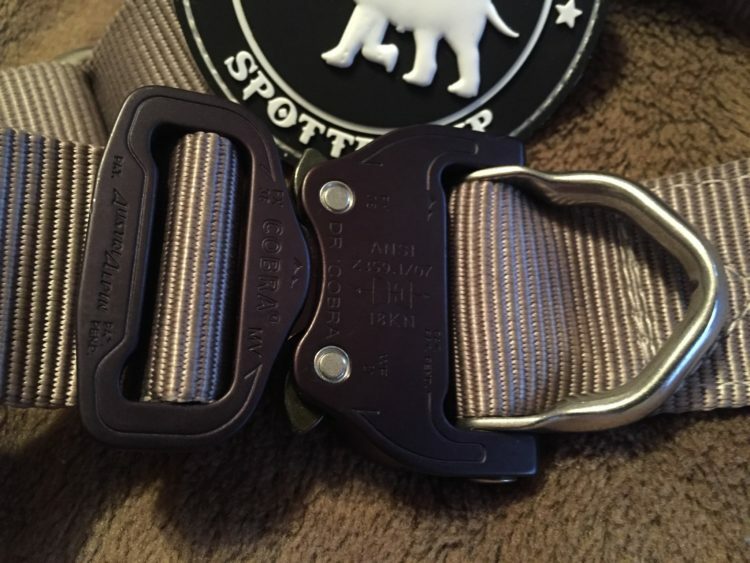 Meaning something similar to a rescue drag strap. Functionally, the collar has no need to be overbuilt in this manner. Unless your missions truly call for the need of reinforced webbing, the current Klik Belts design has tremendous breaking strength, and will not fail. 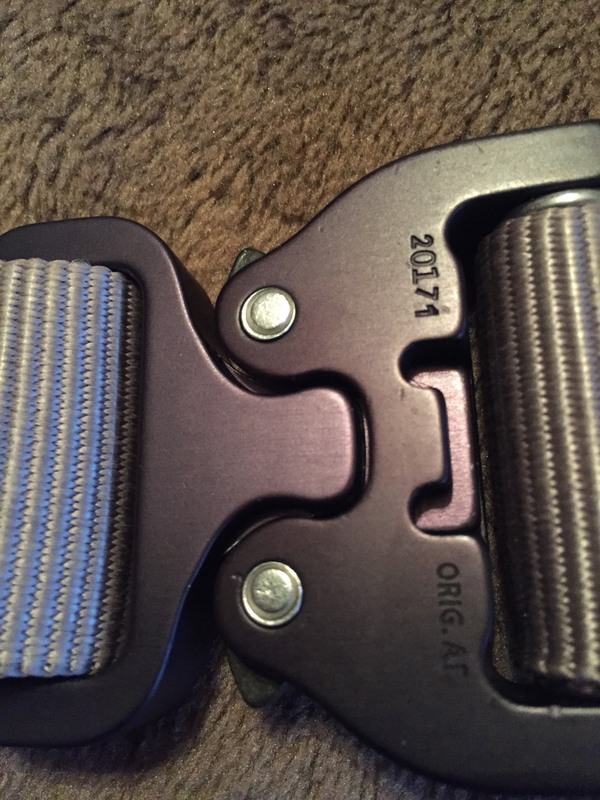 It’s one piece loop, which works its way through one part of the buckle, and through the metal adjustment ring, and then into the other buckle, where it is double box stitched in a loop. This eliminates multiple stitch points, thus focusing on one area where the stitching is focused strong. The very reasonable $49 ($39 for other sizes) really leaves no room for complaints. 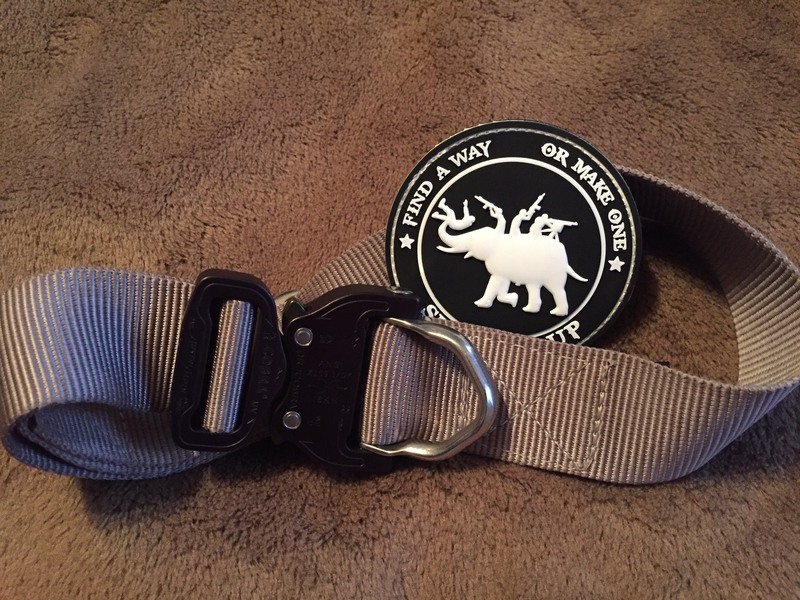 The XL collar is 1.5” wide, while the other sizes are 1” wide. Still, I think a double loop or reinforced webbing, on at least part of the collar might be desirable for some users and would be well priced around $60. This would allow a more stiff collar, and ability to attach Velcro or some utility items such as lights or a small aid kit. The adjustment of the collar is very smooth. The polished “H” type adjustment ring makes it very easy to manipulate the collar while it is one the dog. This means that it can be loosened when conditions get hot, or tightened to allow more control. 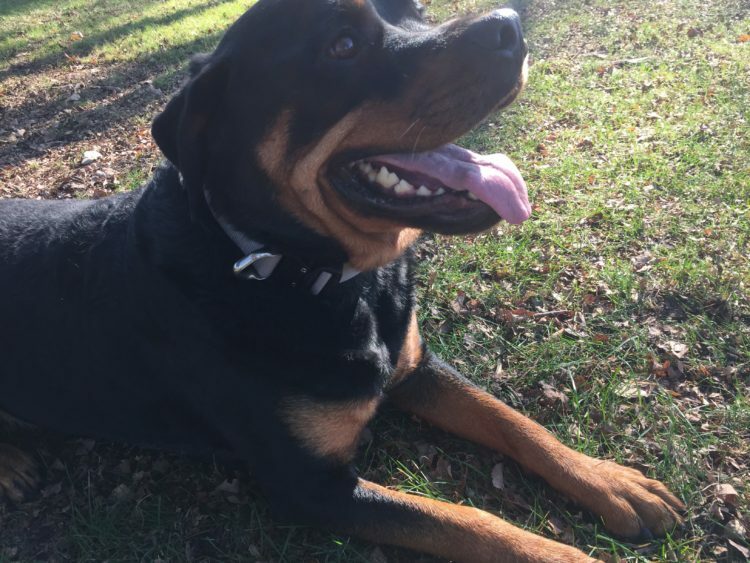 Overall, I am impressed with the function and durability of the Klik Belts dog collar. Its is fair priced, clean in appearance, and comes in many colors and sizes. As we always say, how a company stays behind their products adds to the product’s desirability. Klik belts offers free shipping, and 100% satisfaction money back guarantee. And the Cobra buckle? It’s a snap. The operation is snag free and smooth and holds solid by design. There is redundancy in the clasp itself by how it locks in and secures. The D-ring is a solid piece riveted construction, and esthetically clean in appearance. I am actually more impressed with how secure it is and am glad that I went into this review a little skeptical. More importantly, reading my canine partner I can see that he’s happy with it, and a little rustle of the collar perks him right up to work or play. Klik Belts is based in Austin, in the great state of Texas.